No guessing necessary today, as the #ThrowbackThursday shows three photo of the same location and there's no hiding the location of the old Skuller's clock. In the comments, please share your memories of Skuller's and its memorable clock. 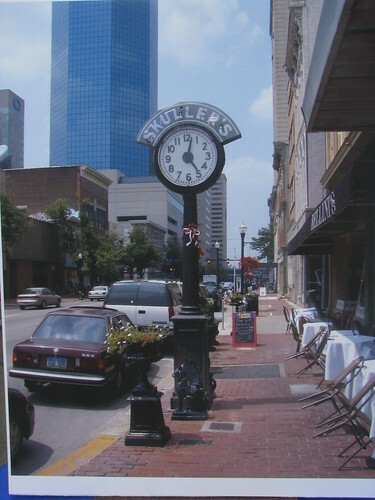 Near the northwest corner of Main and Limestone stood the old Skuller's clock which was originally manufactured by the Brown Street Clock Company in Pennsylvania in 1913. 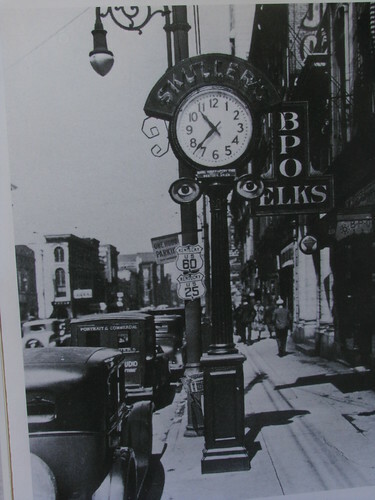 It arrived at the location in the 100 block of West Main Street first in 1931 when Skuller's relocated to what is now the downstairs ballroom of Bellini's restaurant. Evidence of Skuller's remains with the inlaid tile at the old entrance; the store closed in 1984. But the clock hung on. At fourteen feet in height, the two-faced clock is fixed upon a fluted iron column. It is, in its own right, a Lexington landmark. 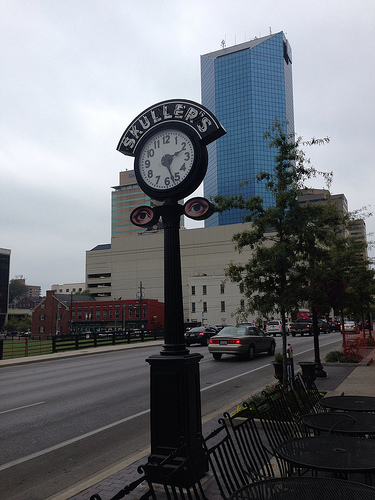 The clock originally featured (and does again) a lit neon sign bearing the Skuller's name. The jeweler also sold eyeglasses for a time which explains the eyewear (and painted eyes) appearing below the face of the clock. Yet by 2010, the clock was inoperable and was removed as part of a streetscape beautification project in anticipation of that year's World Equestrian Games. The promise was made that the Skuller's clock would be restored. Estimates for rehabilitation of the clock were about $25,000. Private funds were secured and tomorrow, at 7:15 p.m., the clock will once again tell time for those downtown.